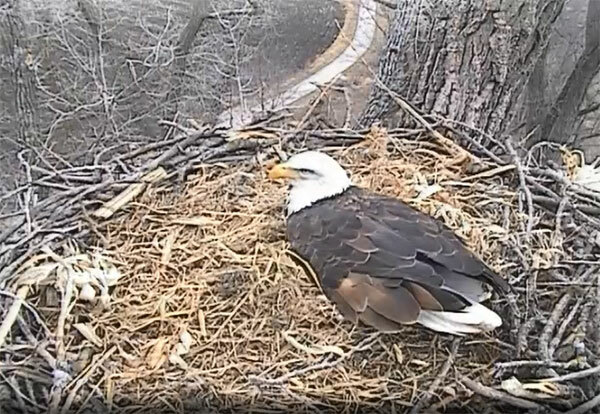 View from the Decorah eagle cam. Alliant Energy is installing some equipment on power poles in southeast Iowa’s Keokuk County today to try and protect eagles and other wildlife. 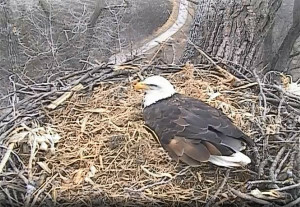 The company started looking at adding the equipment after one of the Decorah eagles was electrocuted. Alliant spokesman, Justin Foss, says not every power pole is a danger. “Some of the power poles have extra equipment on them — in the industry we call them cutouts and arresters — other pieces of equipment that help bring the electricity down to a farmstead. And it’s those pieces that raptors can sometimes touch and get electrocuted on. So, on those pieces of equipment, on those poles, we are going to be able to add this extra equipment to protect them,” Foss says. Foss says eagles used to stay closer to water and were in these more rural areas where the poles are located. But, they’ve found the eagles are feeding on carcasses from an animal operation and showing up in areas they weren’t expected to be. The new equipment will provide more protection for the poles in the area. “If they do land around there, then we’ll have other cover ups and other protective material to hopefully prevent another electrocution down there,” Foss says. Foss says they looked at poles in a 6-mile radius of where the eagle was electrocuted. “Not every pole presents the same hazards for raptors and birds, so we’re going to target the ones that have a lot of the extra equipment that is more dangerous and concerning,” Foss says. He says the things being installed will help prevent eagles and other animals from being killed or injured, but won’t ensure it never happens. “Even with all the investments and all the protection equipment out there, you just can’t protect 100 percent, and that’s part of what we’re trying to mitigate and work against here,” Foss says. “If you installed this really good plastic equipment out there, there’s nothing to say that a raccoon or a squirrel won’t come through some day and really gnaw it and chew it.” Foss says they will do what they can to make the equipment safer and prevent injuries to animals.